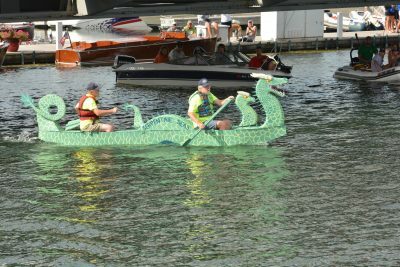 The Door County Classic & Wooden Boat Festival is making its annual call for entries for the various events associated with the festival, August 12 & 13. The call includes boats to be exhibited, teams to compete in the Sikaflex Challenge boat building competition and artwork for the new Art Mart Sale. The festival is scheduled for Friday evening, Aug. 12, and Saturday, Aug. 13, to be held in conjunction with Saturday’s Maritime on Madison festival being conducted along Madison Avenue on Sturgeon Bay’s Westside. 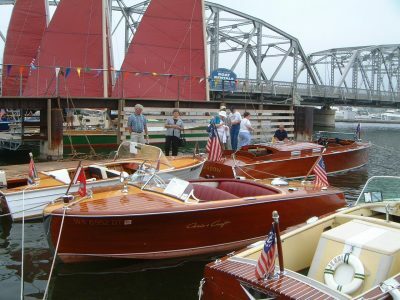 The Door County Classic & Wooden Boat Festival annually features a remarkable assortment of vessels which will compete for People’s Choice honors. Boats will be displayed either trailered, in-water or on the grass. Registration materials and information are available at the museum, 120 N. Madison Ave., Sturgeon Bay, online at the Door County Classic & Wooden Boat Festival page or contact boat registration coordinator Bill Freyman at dcclassicboatfestival@gmail.com. tion on Friday evening and the race on Saturday. The field is limited to 12 two-person teams. Again, participants are restricted in the amount of wood and tools being provided with an ample supply of Sikaflex marine sealant available for use during construction. Visit the museum’s website or contact the museum at (920)743-5958 for rules and registration materials. Entry is $20 per team. The event is being locally sponsored and is being conducted in the memory of Robert Peterson, a respected shipbuilder in the community. 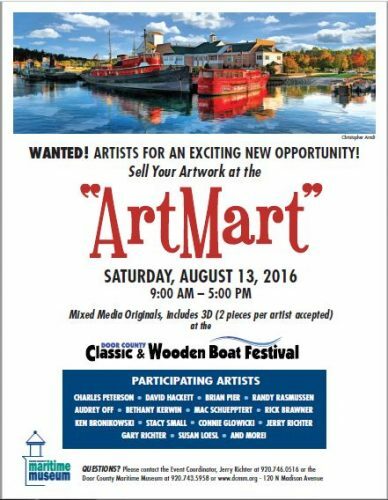 Art Mart is new for 2016, replacing the “Paint the Bay” plein air event. Area artists will be providing their works for sale with a portion of the proceeds to benefit the Door County Maritime Museum. Artists interested in presenting their art for sale should contact Art Mart coordinator Jerry Richter at (920)746-0516 or the Maritime Museum (920)743-5958.